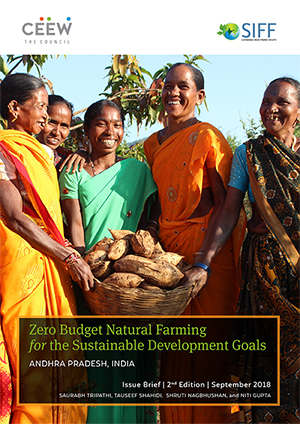 This issue brief maps the potential social, economic, and environmental impacts of the Government of Andhra Pradesh’s (GoAP) Zero Budget Natural Farming (ZBNF) programme vis-à-vis the Sustainable Development Goals. Once rolled out across the state, ZBNF could help Andhra Pradesh and India make significant progress towards almost a quarter of the 169 SDG targets. ZBNF is a low-input, climate-resilient type of farming that encourages farmers to use low-cost locally-sourced inputs, eliminating the use of artificial fertilisers and industrial pesticides. ZBNF inputs are natural concoctions, inoculums and decoctions prepared with cow dung, cow urine, jaggery, lilac, green chillies, and other such natural ingredients. 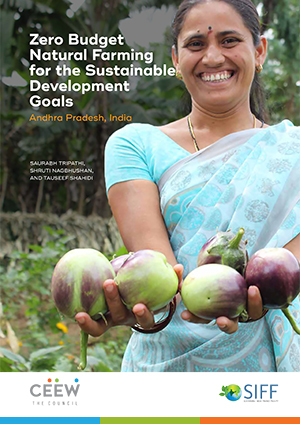 On 25 January 2018, Andhra Pradesh’s Chief Minister, Shri N. Chandrababu Naidu, and UN Environment’s Executive Director, Mr Erik Solheim, released our issue brief ‘Zero Budget Natural Farming for the Sustainable Development Goals: Andhra Pradesh, India' on the sidelines of the World Economic Forum in Davos. ZBNF techniques have shown preliminary evidence of improving resilience of farmlands and crops against extreme weather events. During a bout of cyclonic winds in Vishakhapatnam in 2017, anecdotal records from farmers show that ZBNF paddy withstood the winds and water-logging better than the adjacent non-ZBNF paddy fields. Some ZBNF farmers have also reported a reduction in their yield loss during droughts, owing to improved soil fertility and strength. In over two years, the programme has been rolled out to 138,000 farmers across all 13 districts of Andhra Pradesh, bringing almost 150,000 acres of agricultural land under the ZBNF model of agriculture. Initial indications from the ground suggest that farmers practicing ZBNF in Andhra Pradesh could experience a decline in their input costs and an improvement in their yields. The programme at scale could generate significant rural employment opportunities across the agricultural value chain. Andhra Pradesh’s ZBNF programme offers 50 percent financial support to the 'poorest of the poor' farmers for adopting ZBNF. Adopting Zero Budget Natural Farming holds the potential to reinvigorate rural economies, reduce credit risks for farmers, and help agricultural families to allocate greater resources for education, health, and financial security.